Sometimes a drive is not visible in the Explorer even if it is available. You want to know where it lies and how the error can be rectified. 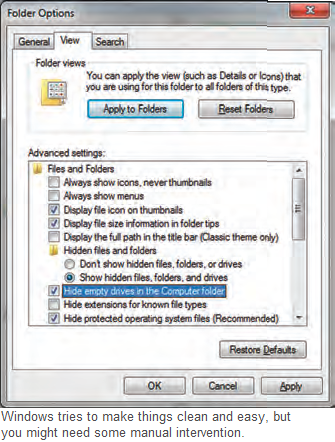 The reason for this effect is the default activated option for hiding empty drives. This behaviour is planned by Windows and takes care of clutter, as lots of empty drives of a card reader are otherwise visible and confusing. Thus even empty, newly created partitions also disappear, or data storage devices in other unusual cases. It is better to deactivate this function to be able to see of all the available drives. Use the command ‘Organise | Folder and search options’ in Windows Explorer and change to the tab ‘View’. Deactivate the option ‘Hide empty drives in the ‘Computer’ folder in the ‘Advanced settings’ area.